This fall, Mt. View High School Resource Officer Ashley Volz (pictured) will be one of four in the district. The new SRO will be stationed primarily at Marshall High School. Photo by Matt Fox. In the wake of the most recent mass shooting—this time in Isla Vista, Calif., near the University of California at Santa Barbara, where Elliot Rodger allegedly killed six people including himself—the ripple effects are coursing through the nation’s consciousness. While “active shooter events,” as the FBI calls them, have been a part of our social fabric since colonial times, their frequency and severity, as well as the public awareness and discourse about them, has risen in the last decade, particularly since 2008. The FBI reports that from 2000 to 2008 there were approximately five ASEs per year (not including gang-related shootings), but between 2009 and 2013 that number tripled, approaching 16 annually. So it’s not just a growing awareness or more hyper and prolific news coverage—these violent acts are really becoming more frequent. 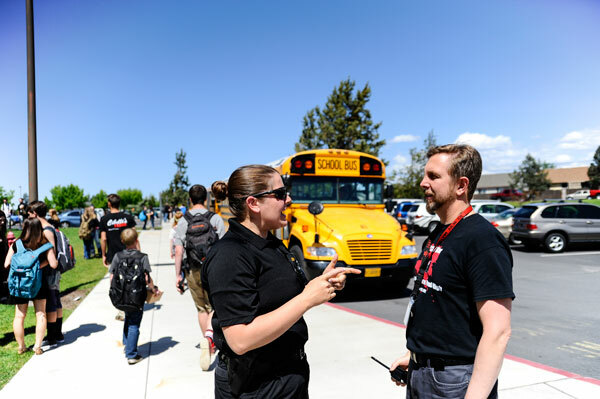 At its May 21 meeting, Bend City Council approved hiring an additional school resource officer to be stationed primarily at Marshall High School. According toSummit High School Resource Office Scott Vincent, Officer Chris Stokes will start this fall after completing national and state-level training for school resource officers. Still, the security piece is important and Vincent says Bend-La Pine schools are well prepared to respond to an attack. Last fall, he revamped the district’s active shooter response protocols. This spring, he attended a conference in Chicago where he spoke with experts in the school safety field. “I love to get those calls because it means our campus community is paying attention,” Elliott says. His approach to safety is centered on awareness. Unlike the local high schools, which are required by state law to perform regular drills for a variety of emergency situations, including active assailants, COCC doesn’t do drills. Elliott says that while staff may run through various scenarios, the school is simply too large to coordinate a campus-wide drill. And more extreme re-enactment style approaches don’t jive with his philosophy. Ultimately, preventing and responding to school violence takes a community wide approach, he says. And Kathy Biles, the professor who heads up OSU Cascades’ school counselor program, agrees. “Prevention is the big word,” Biles says. But it’s not just school staff and parents who have a part to play, Biles adds.